Like most rooms, a beautiful kitchen lies in the details. You can have custom cabinets, surplus counter space, two Viking ovens, and a SubZero double-wide. But if you don't accessorize, if you don't have the right utensils, it might as well be on the showroom floor at Home Depot. Martha Stewart is one cook who has mastered this concept. 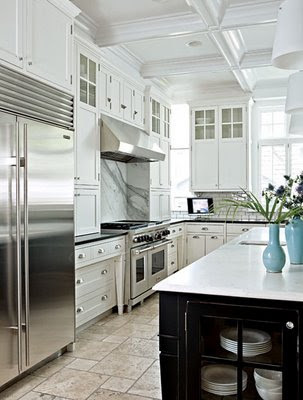 Her kitchens - both on the show and in her homes - are drop-dead gorgeous. 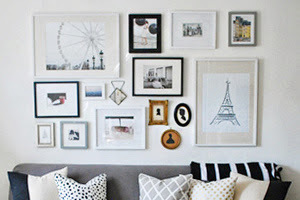 Many of these featured in today's post are from her homes, show, and website. The photos above and below are of the same view. 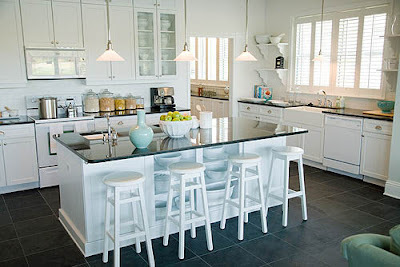 But below, you can see some of the hidden gems that are useful to have in the kitchen but eyesores to the overall decor. 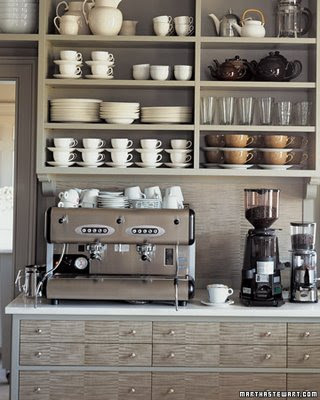 This espresso station is actually made up for the various colors that go into making our favorite caffeinated beverages. Genius and delicious. 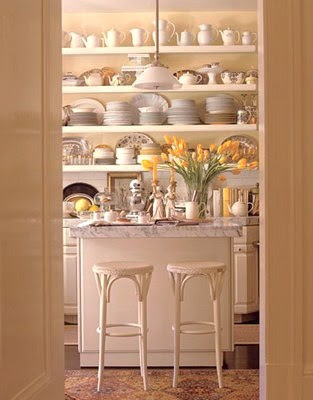 Love the white dinnerware peeking through the glass cabinet doors. More yellow and more white dishware meant I couldn't pass this photo up. 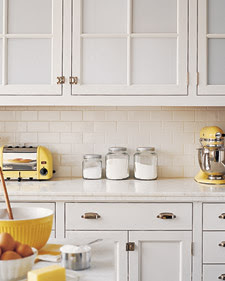 You don't need fancy new cabinets and appliances to have a beautiful kitchen. 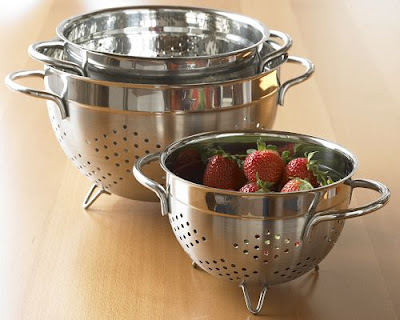 So why a post on kitchen accessories? Yesterday I saw this video posted on West Elm's Facebook wall and had to share it with all of you. 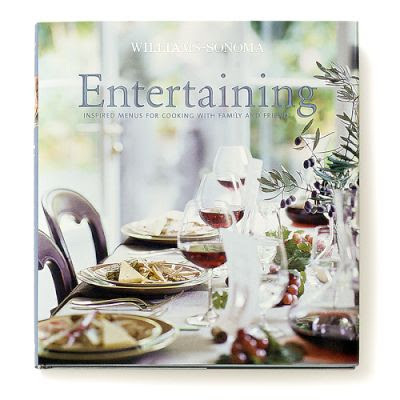 Meet the man who started the kitchen craze in America: Chuck Williams, founder of Williams-Sonoma. The video is chalk-full of historical details about the man and his legacy so I urge you to watch. 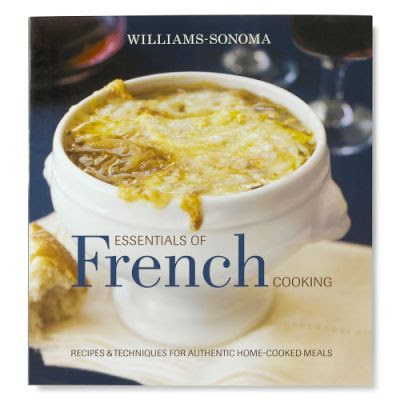 It begins with Williams' inspirational trip to Paris - everyone needs to go at least once - where he discovered the oh-so-beautiful French copper cookware, which at the time, was not available anywhere in the U.S. So what did he do? Brought it back to sell to the masses. The rest you could say is history. aka a billion-dollar corporation and a slew of fabulous stores we all know and love... including Williams-Sonoma, Pottery Barn, and West Elm. The pots that started it all. And the most gorgeous collection of cookware I've ever seen. My mom actually has a set of these and they really make the food that is in them look more beautiful. They're a magnificent way to display fresh fruit come summertime. Mainly because of the color. This is one of the only kitchen electronics I wouldn't mind leaving out on the counter. 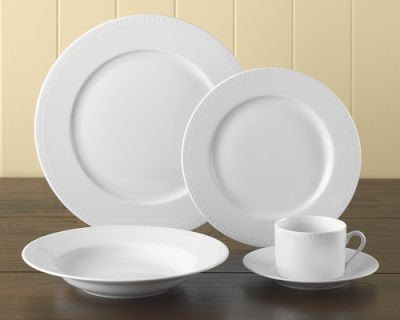 White dishware is classic. The beading trim gives it that something extra. 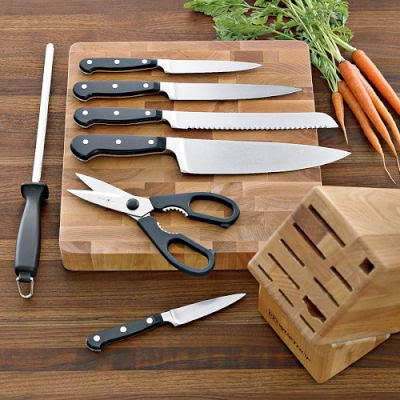 Because knives are important. Or so I hear. "The mortar and pestle carved from volcanic rock is among the world's oldest kitchen tools. 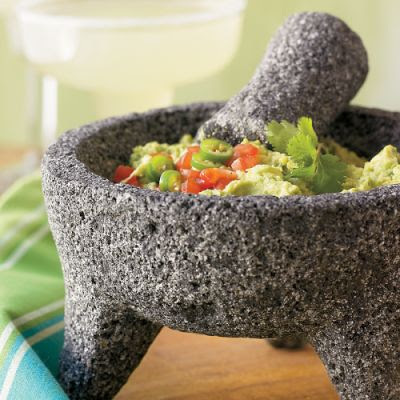 Today, you'll find a mortar and pestle handy for blending guacamole..." Volcanic rock. World's oldest. Guacamole. How could you not want this? 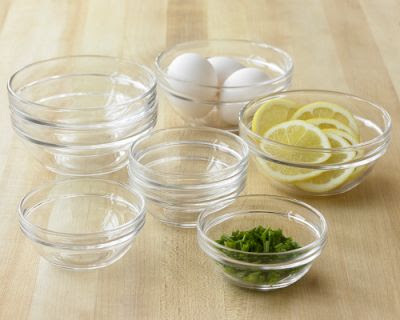 Essential for Mise en Place - "Everything in place." I don't know. I see it on the Food Network. I'm guessing every item in this book is creamy, cheesy, and delicious. I'll take it. So. 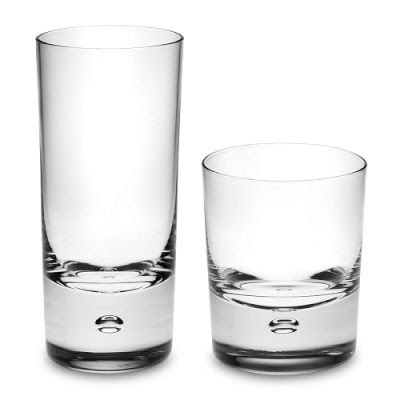 What would you get if you could have anything from the wonderful world of Williams-Sonoma? I actually saw that Williams Sonoma segment on CBS sunday morning last week. It was great! 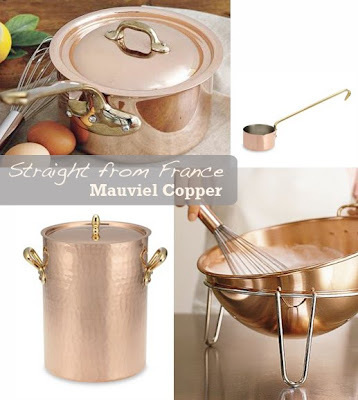 Copper pots are on my "If I ever have extra money" list. 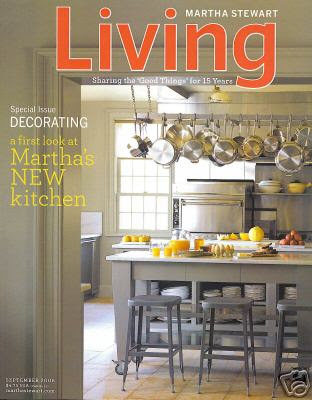 I wonder how often Martha Stewart gets a new kitchen. Lucky girl. My wishes at Williams Sonoma include the Margaritaville margarita maker and the copper hot chocolate kettle. Sadly, the only wish that fits my budget right now is the sandwich cookie cake pan; it makes layer cakes that look exactly like an Oreo! You bake 2 cake layers and then sandwich Oreo icing in the middle. Genius! couldn't agree more...i have the Apilco dishes and love them! 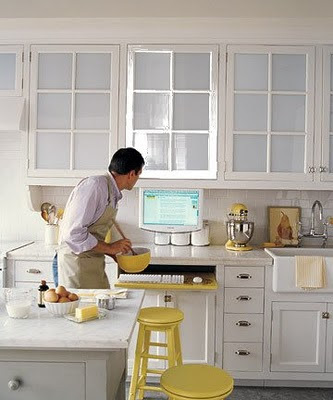 Ahh if I lived with one of those kitchens, I would truly never leave the house! So in love!! 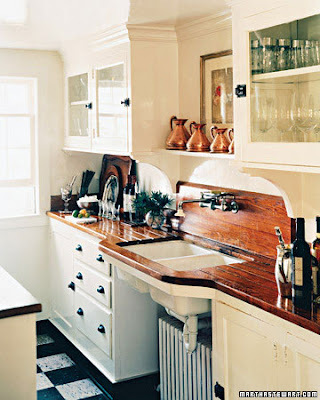 I am in agreement with the copper pots and pans- so gorgeous.. Now I'm just dreaming of a bigger kitchen to house everything! 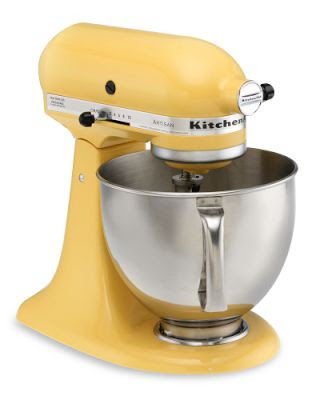 I have a Navy Blue KitchenAid mixer on my counter. It goes well with my grey/blue walls in the kitchen. My kitchen and family room flow together and I would like to get discard an island and put in a banquet that could accommodate my kitchen table. The banquet would also have storage underneath the seating and possible a bookselve on the side. I then would like to get a cart on wheels that would store my other baking utensils and would be my workspace and has a drop leave for extra seating -- I've seen many on the internet. Alaina -- do you know of anyone who can build a banquet bench and storage unit? I would LOVE the white place settings that you featured. Those have been on my wish list for a while!! i'm in the process of registering -- thanks for the great finds!! You are spot on with yellow and grey, I am seeing it everywhere too. Everyone thought I had gone a little crazy last year when decorating my apartment, and I decided to paint my coffee table electric yellow and accessorize with grey pillows, but apparently I was spot on. I just got the CB2 magazine and it is full of grey and yellow. 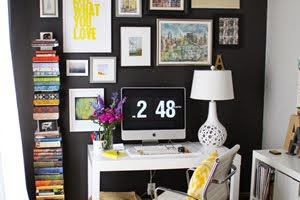 I am obsessed with the color combination and loved seeing it in a kitchen…so cool!